Endurance Nation and I have a long and illustrious history at Ironman® Wisconsin — I raced the inaugural year of the event in 2002, finishing in 10:05 and earning my first Kona slot. I’ve since raced it in 2004 and 20011, and have conducted training camps on the course and Four Keys Talks every year of the race since 2002. 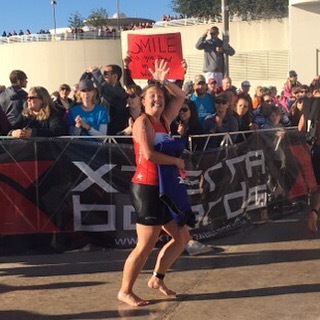 Endurance Nation has had 25-45+ athletes in the race every year since 2008 and this year I was in the water with them, toeing the line for my 4th IMWI appearance, and hoping to earn another Kona slot after a four year racing hiatus. 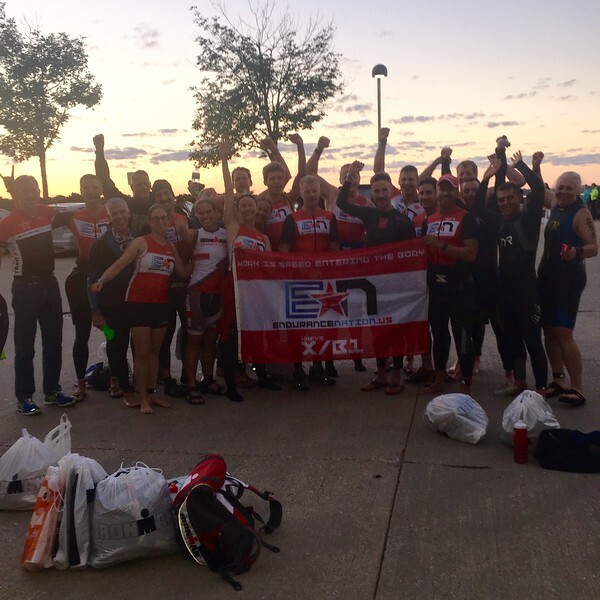 I will publish my own race report shortly, as well as record podcast interviews with a few our standouts from the weekend, but this post is to give you a quick overview of day and to congratulate all 23 Team Endurance Nation finishers for reaching their finish line! Jeremy Behler, 9:52, 3rd place and KQ in M35-39. Jeremy crashed at the very high speed bottom of Timberlane (!) and rallied to post a 3:26 run split! Peter Noyes, 10:12, 10th in M30-34. Peter crashed in April, breaking his clavicle, welcomed a new son in June, rallied his fitness, scratched both corneas during the swim and still posted a 3:24 run split in only his 2nd Ironman! 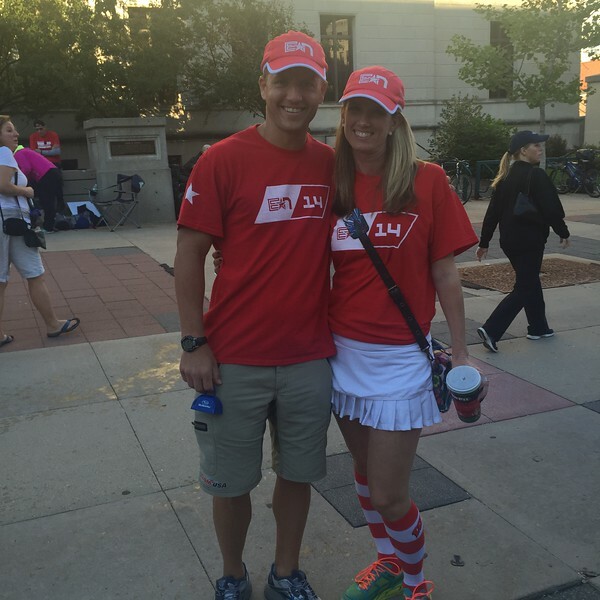 Scott Giljum, 10:36, a 38 minute same course PR over Ironman Wisconsin 2014. Rachel Hawe survivor to the furnace of IMCDA’15 to put up a 70′ same-course PR this year in Madison! …and many more massive PR performances! One of the best parts of race week is a chance to reconnect with old friends and make new ones. 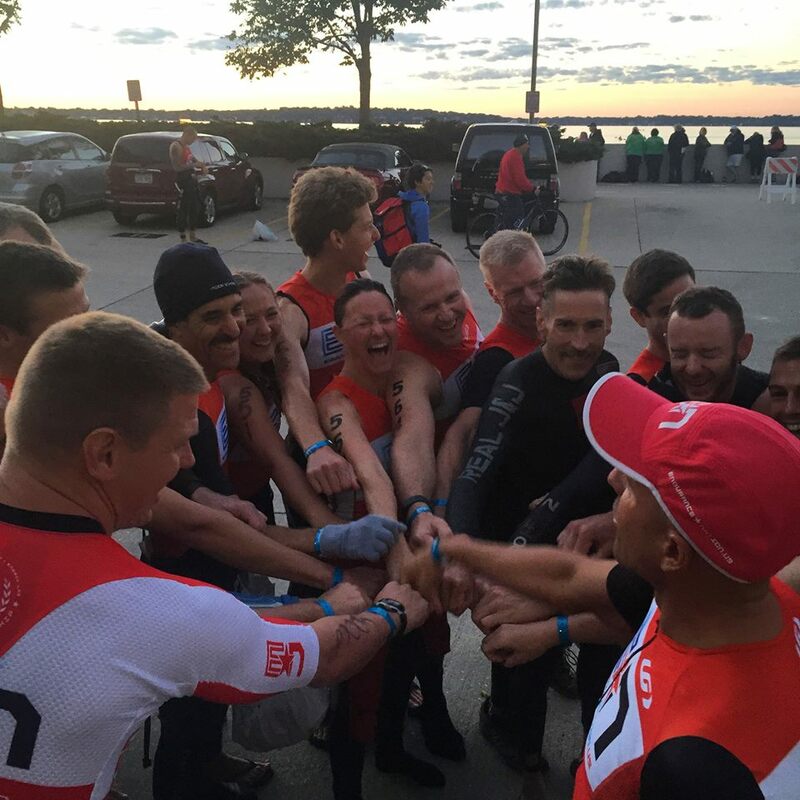 Seeing as Ironman® Wisconsin was a TeamEN Key Race this year, we had quite the contingent of members new and old. Dinner was a great chance to connect with one another and have some fun before the nerves of race week truly set in. 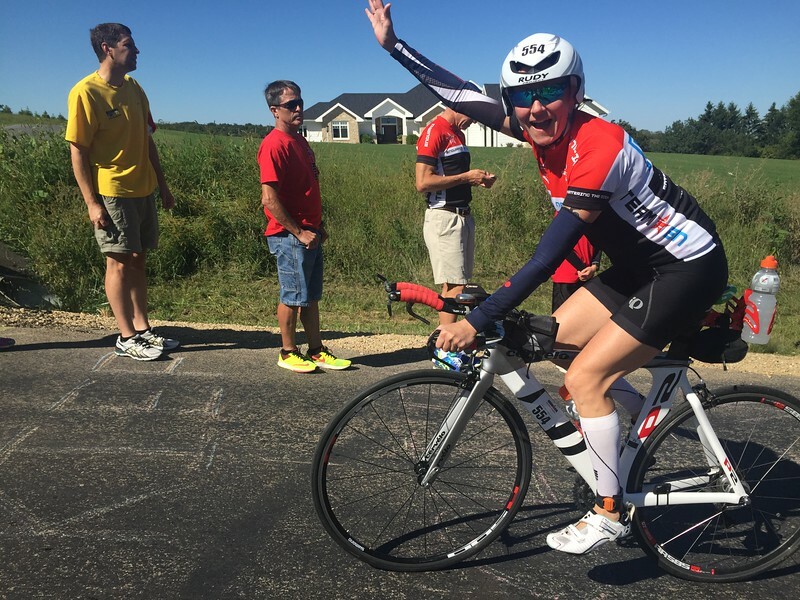 Friday was our Four Keys of Triathlon Race Execution and Complete Wisconsin Course Breakdown, held for the 3rd consecutive year at the Overture Center for the Arts. 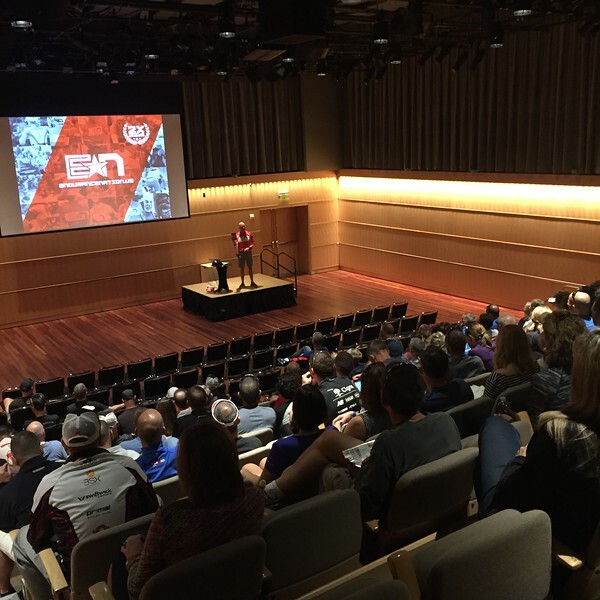 Nearly 200 athletes attended to listen to Coach Rich share with them the Four Keys, simple, proven principles for successfully executing any long course triathlon, and then learn how to apply these principles to every inch of the Wisconsin course. Beet Performer helped sponsor the weekend with Free beet juice for athletes that attended Endurance Nation events. We can’t BEET around the bush, we love Beet Performer (especially the passion fruit flavor) Studies have shown that beet juice increases athletic performance and improves stamina and strength in endurance athletes. Our own Coach Rich used Beet Performer to prepare for Wisconsin and we think his race was BEETastic. EN athletes enjoy the sponsors upBEET attitude and support of the team with wonderful discounts. Wisconsin was lucky enough to have TWO amazing sponsors giving away FREE swag at the Four Keys talk. Bottle Bright is a revolutionary way to clean your bottles. As we all know triathletes go through lots of bottles and sometimes they end up with mold, hard to clean dirt and grime. That is where Bottle Bright comes in with chlorine free, no harsh chemicals, easy to use and biodegradable ingredients that keep all of your containers clean unlike dishwashing alone. Bottle Bright is a fantastic sponsor of Endurance Nation and all of our squeaky clean bottles! The weather this year was exceptional, with high 40’s race morning warming to low 50’s early on the bike and topping out in the high 60’s for the run. Clear skies, low humidity, a little wind on the bike that became a nice cooling breeze on the run. Again, pretty much a perfect day for racing, especially on the run. As the two-time World Champions of the Ironman Tri Club Competition, we were offered our own rack. It was a very fun and unique experience to prep your bike with the help and camaraderie of your fellow teammates! We all then hustled down to the area behind the terrace for team photo, a quick review of the Four Keys so I could get everyone’s minds right, and then break the tension a bit with a fun “all hands in, on 3!” moment. Ironman® Wisconsin is one of the few remaining mass starts swims and my guidance has always been to line up near the ski ramp to avoid the fast guys lining up on the buoy line, and the other large group of people hugging the shore. As for my race, I lined up between the buoy line and the ski ramp. As a result, I missed hooking on to the first group of fast swimmers and found myself leading the second group. So I sat up and swim a comfortable a 57:51 swim, saving my energy for the bike. Lindsey, your team sure is proud of you and your infectious smile! The Wisconsin bike course remains, in my opinion, the most challenging course on the US circuit. The course constantly forces you to make decisions, as you’re never doing one thing for more than 2-3 minutes at a time. As such, the smart, disciplined, well-rehearsed athlete can excel over his peers. 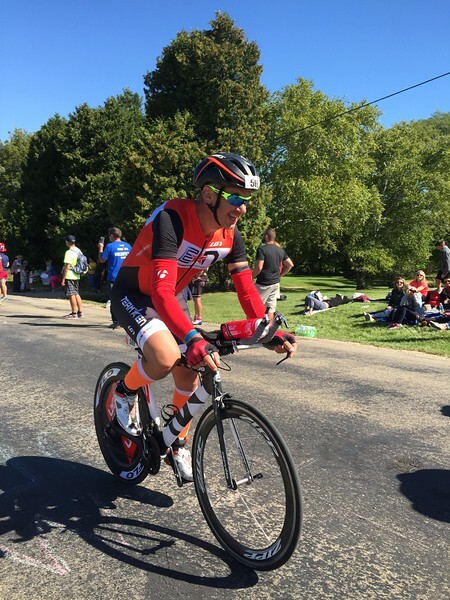 The highlight of this year’s bike course was the cooler temps, which likely required most athletes to tweak their race plans to account for a reduced sweat rate, reduced sodium requirements, and more. Wind this year was another component, adding an additional variable to include in your pacing decisions across the day. Just another day at the office for EN rockstars! Despite riding the full course three times during my training camp in July…the roads on race day just seemed to be especially rough. Maybe this was from riding a different bike or just paying attention more, but I felt like I couldn’t catch a break from the rough surfaces. The aid stations seemed shorter this year, with the Last Chance Trash area position very close to the end of the aid station. I learned very quickly that I needed to slow down and be deliberate about getting what I needed and organizing it before exiting the aid stations. In addition, the aid station on Bourbon Road in Cross Plains was unexpectedly moved a few miles down the road, closer to the hills that begin with Old Sauk. Finally, Verona remains just a bad place for this aid station. Great for spectators but not so great for cyclists ripping through at 24-27mph on the first loop, or mixing with slower riders on the second loop. That said, while I didn’t have the bike split I trained for and believe I was capable of, I raced smart, solved some critical problems that could have derailed my day, and seem to get a lot of speed from my watts. Of course, being my lightest weight since 1989 didn’t hurt either! The first couple miles of the Wisconsin run are relatively high energy and mostly downhill, before you begin to wind your way into campus. Then it’s a quick trip around the Camp Randal football field, through the hills on Observatory, awesome mojo on State Street, then great running surfaces on the bike paths, before heading back towards the capitol. In short, the run course is “just a run,” with nothing particular epic outside of the rather significant, but thankfully short, hills on Observatory. As for me, I came off the bike between 14th and 19th overall, depending on who was yelling at me in the first mile, and 1st in the M45-49 AG. I’m not a particularly fast runner but I had done a ton of work this season to improve the run I do have. I used the pacing, heart rate, and nutrition guidance, as well as the mental skills, we teach to our Team to simply not slow down. I very comfortable (for an Ironman) and in defensive, wait-for-it mode until my final push, which I had planned to make at the last aid station on the out and back bike path, about mile 22 and change. True to form, each mile after mile 22 was exponentially more difficult than the last, but I was able to hold onto the day to finish with a 3:47 run split and 10:07 final time, only 2′ slower than 34yo Rich in 2002. That is how you flash an EN gang sign on the run, Rob! I successfully paced myself so that my physical finish line was only about 10 feet beyond the actual finish line. I left it all out there on the course but after hobbling around for a bit and getting a much needed massage, I took a birdbath in sink at the terrace and went back behind to finish line to greet and attend to the needs of my squad. A few of us then met for beers and stories at Coopers Tavern, then it was straight to bed for this coach! 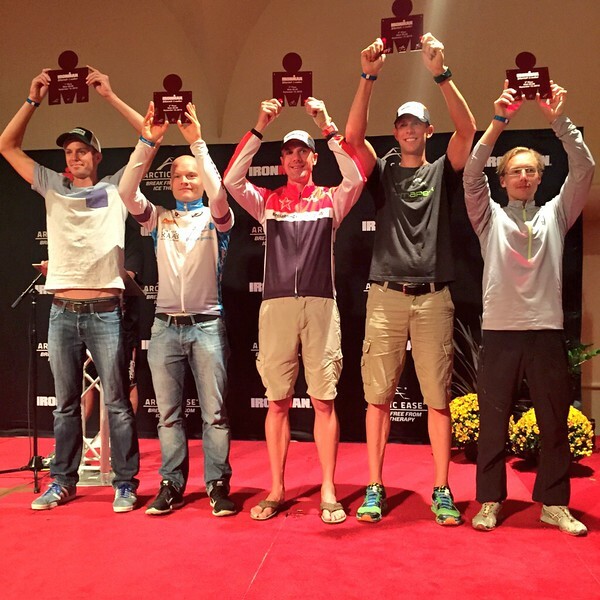 The next day it was very gratifying to except another Kona qualification and to watch my good friend and EN athlete Jeremy Behler accept his first trip to the Show. 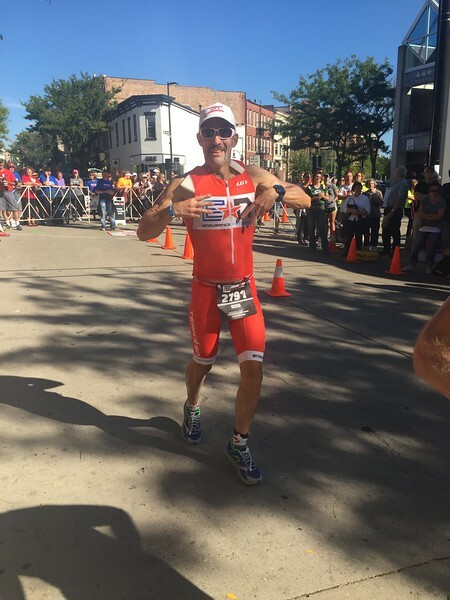 2015 was a year, for me, of training, racing, coaching, teaching, and learning, much of which culminated in my performance at Ironman Wisconsin this year. Very soon I’ll circle back to the EN blog with my full race report and a debrief of all of the lessons I learned this year while crafting and executing a four year comeback and Kona qualifying performance. But in the meantime, I couldn’t be more proud of the performances of our IMWI squad. So many great stories, gutsy performances, and just a top notch crew of incredible people I feel privileged to have on my Team.